(NaturalNews) It is now abundantly obvious that if America is to survive as a nation of law and order, Hillary Clinton must be arrested, indicted and prosecuted for her deep corruption and criminal racketeering. Furthermore, every individual still supporting Hillary Clinton for President needs to be rudely reminded that they are supporting an insidious globalist criminal who ferociously abuses her power by operating an illegal influence racket which surreptitiously funnels hundreds of millions of dollars through the Clinton Foundation. It is time to indict and arrest Hillary Clinton and end this sad, dark era of deep corruption, deception and criminality at the highest levels of our national government. More than half the people outside the government who met with Hillary Clinton while she was secretary of state gave money — either personally or through companies or groups — to the Clinton Foundation. Days after Hillary left Bogota, Prima Colombia Properties, which Frank Giustra has ownership interest in through a shell company called Flagship Industries, announced that it had acquired the right to cut timber in a biologically diverse forest on the pristine Colombian shoreline. Giustra has a long history with the Clintons, giving the foundation over $100 million and allowing Bill to use his plane some 26 times. Giustra allegedly used his connection with Bill to gain connections to the Kazakh government, benefitting his companies. Giustra was also a major shareholder in Uranium One, and his former partners allegedly benefited heavily from the relationship between Uranium One leadership and the Clintons when Hillary’s State Department looked the other way on Russia’s buy-up of the uranium company. Hillary Clinton's "pay to play" corruption ultimately served the interests of oil magnates, weapons development companies and open pit coal mining corporations. "It’s against federal law for charities to act in the interests of private business or individuals," reports the NY Post. "Yet the Clinton Foundation secured high-paying gigs for its namesakes and helped for-profit corporations with family ties set up lucrative deals." Recently, the foundation announced it would ban donations from corporations and foreign countries if Hillary is elected president. The question is: If it’s a conflict of interest when Hillary will be president, why wasn’t it a problem when she was secretary of state? 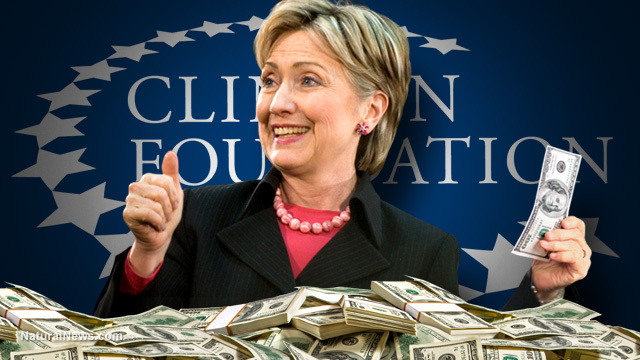 What every international business person running any sort of profiteering scheme knows today is that to get a meeting with the Secretary of State, you first have to donate huge dollars to the Clinton Foundation. It's classic "pay for play," and it's illegal. Flatly stated, Bill and Hillary Clinton are career criminals who have been running a grand scale criminal racketeering scheme to defraud America and peddle political influence to the highest bidder. Sometimes, the bribery money was given directly to Bill Clinton as "payment" for his "speeches." Soon after, Hillary would initiate some State Dept. action in favor of the organization that paid Bill $250,000 or more for his speech. Voila! It's political magic! By peddling their political influence while collecting money as either "donations" or "speeches," the Clintons have committed global political fraud and racketeering at an astonishing scale. And because of the extreme left-wing media which covers for all the crimes of all Democrats, they've continued to get away with it! Now, their extraordinary reign of corruption and criminality is finally coming to an end. It is time to end this Hillary Clinton bid for the presidency and put her behind bars where she belongs. The $156 million paid to the Clinton Foundation by 85 donors was only the beginning of the racketeering and corruption, by the way. According to the Associated Press, another $170 million came from foreign donors. "Clinton met with representatives of at least 16 foreign governments that donated as much as $170 million to the Clinton charity, but they were not included in AP’s calculations because such meetings would presumably have been part of her diplomatic duties." In other words, what's really happening here is that the Clintons have collected hundreds of millions of dollars in bribes and payoffs while leveraging their positions of government influence to grant regulatory decisions, approvals and other favors to those who coughed up the most money. This is deep, criminal corruption at its worst. The hundreds of millions of dollars in "pay to play" donations to the Clinton Foundation means that Hillary Clinton has already pre-sold the White House to foreign interests. This means that if she is elected President, she will be prioritizing the globalist interests of her rich donors over the interests of Americans. Hillary isn't just willing to sell you out, she's already sold you out! We the People simply cannot allow this traitorous criminal to attain the highest political seat in the nation. She is a clear enemy of America and an international racketeering and money laundering mafia boss. The FBI -- if it has any loyalty to law and order whatsoever -- must go public with recommendations of charges of corruption against the Clintons. And all those left-wing media outlets and shameless celebrities pushing for Clinton should be absolutely ashamed of themselves for promoting such a lawless, traitorous criminal. Their support for Clinton just shows the absolute lawlessness and political criminality that infests the minds of many on the political left. Their slogan is "win at all costs," even if it means voting for a murdering criminal engaged in deep acts of political corruption. Click here to watch the jaw-dropping Clinton Cash documentary on Breitbart.com. This is a must-see film if you seek to understand even a little of what's going on with all this. The answer to all this is, of course, Donald J. Trump. If you're fed up with the criminality and corruption of the Clintons, vote for Donald Trump and give America one last fighting chance against the globalist political cartels that are seeking the complete subversion and occupation of America.